Oh Iceland...you have been on my bucket list for some time, and you exceeded all of my expectations. Iceland is tough to describe. Being in Iceland makes you feel like your are in Game of Thrones, Lost, and Heaven all at the same time. It is a magical place that is full of untouched, pristine nature, wild horses, and kind people. I was in graduate school in Baltimore, Maryland. I was eager to travel and my spring break fell at a perfect off-season travel time, March. Fortunately for me, I have an awesome friend and roommate who was down to take a random, spontaneous adventure with me. I was familiar with WOWAir, but had never flown with them before. As luck had it, WOWAir flies Baltimore-Washington straight to Reykjavik. We scored a round-trip flight for $300 and started planning our adventure. I used the Lonely Planet's Iceland guide book to help plan the trip. Lonely Planet also has lots of free information on their website if you don't want to spend the $20 for a guidebook. I'm not usually one for guidebooks, but I was super impressed with Lonely Planet's formatting, suggestions, and helpful maps. It especially came in handy when I couldn't pronounce a single town, landmark, or food item in all of Iceland. Make sure to check out 10 Things You Need to Know Before Going to Iceland for general travel tips, advice, and hacks. 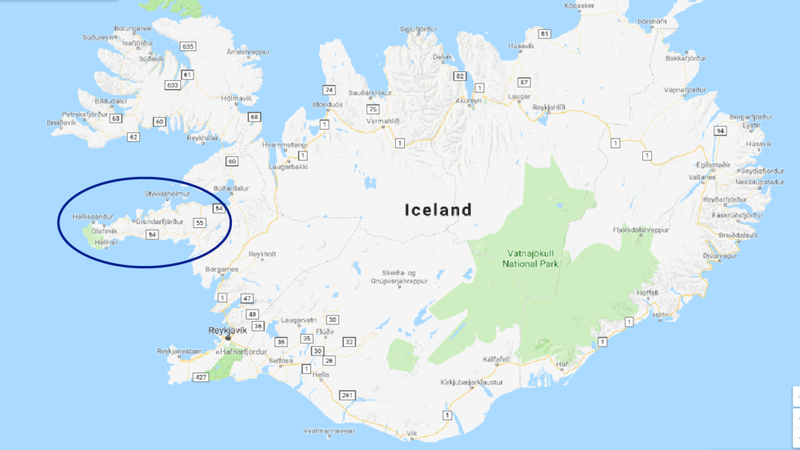 If you are in Iceland to see the whole country, rent a car and drive Route 1, famously known as Ring Road. The 800-mile road takes you around the whole country and is full of amazing sights and activities. Driving all of Route 1 was not an option for us due to winter weather conditions and our short time there (6 days). Route 1 is basically the only road in Iceland which makes getting from Point A to Point B fairly easy. We rented a cute SUV from Route 1 Car Rental. I have nothing but positive things to say about my experience with them. A man was waiting for us at the airport when we arrived at 4:30am. He brought us to our rental car and we were on our way within half an hour. They accommodated our request to keep the car an extra day with no problem and even let us drop it off at a different location than originally planned. Route 1 was the most affordable rental company we found. Overall, wonderful experience and I highly recommend using them! I love Airbnb. It is always my first stop when looking for a place to stay. I found some of the coziest Airbnbs in all of Iceland for a very affordable price (remember, it was offseason). If you are new to Airbnb, click HERE for $40 off your first stay! I also love hostels. I stayed in two very nice hostels while in Iceland. I stayed in mixed gender dorm rooms both times and had a very positive experience. I even met a few friends! Loft Hostel in Reykjavik - Perfect location! The names of these activities and towns were nearly impossible for me to pronounce. In hopes of making this travel guide a little easier for you all to understand, I have included a map to give you an idea of where the activity is located in the country. If you find this helpful, contact us here, or let me know in the comments below and I will include maps for more posts! Also, if you have any questions about routes, locations, or sites, please let us know, and we'll be happy to help! Breioafjorour: A beautiful fjord. Iceland has lots of fjords. For those of you who don't know, a fjord is an opening between two mountains. Simple but beautiful. Sugandisey: Lighthouse at the top of a hill, it was a short walk up (~50 steps) and a beautiful view! Berkserkjanran: Lavafield—Still not totally sure this is a picture of the actual lava field. Lava fields covered in snow are much harder to identify than lava fields not covered in snow. Kirkjufell: The most photogenic spot in all of Iceland. No, literally, it is the most photographed spot in all of Iceland. You can take a short walk up a small hill and get a better photo, but due to the snow, I skipped this option. Sjavarpakkhusid: The only restaurant open in town. It was a cozy, seafood restaurant. We shared a salad and two seafood soups. It was warm and delicious. Urridafoss: A rather shallow waterfall right off Route 1. It makes a perfect picnic spot on your drive to Skogafoss. Seljalandsfoss: Another beautiful waterfall, if you walk behind the waterfall be very careful because it is really slippery, and in the winter it's icy. Gljufrafoss: A 10-minute walk from Seljalandsfoss. If you are looking at the waterfall, you walk to the left. You will see a small space between two rocks. Go between the two rocks and prepare to be amazed. Also, be prepared to get wet. We didn’t get soaked but the camera did get wet. I recommend a cheap poncho that you can throw over yourself and camera. Plane Crash Site: We did not get the chance to take the walk (~1 hour walk) out to the plane wreckage sight, but I’ve heard it's amazing. The plane site is located pretty far off Route 1 and cars are not allowed out there. You will see a car parking area along Route 1. There were always lots and lots of cars when we drove by. It is between Skogafoss waterfall and the town of Vik. Solheimajokull: A large glacier. We drove to the car park and walked a half mile to see the tip of the glacier. I imagine it is more impressive in the warm months. We could barely see a difference between the snow covered mountains and the glacier. You can book a tour to walk on the glacier, which may be a good bet because the guide will definitely know where the glacier is. Hotel Skogar Restaurant: I don’t recommend this restaurant per se, but it is a place to eat if you are in need of food in Skogar. We ate here because we were stranded at Hostel Skogar due to an inpromptu winter storm (see picture). We each had a burger for ~$16 USD. Always a good idea to check the weather before you set out on an adventure. Jokulsarlon Lagoon: I mean wow. This place is magical. It is a glacier lake and the views are just incredible. I recommend parking before the main car park and walking to see the lagoon from there. There are much fewer tourists and the views are just as great. I really enjoyed just walking around the lagoon, taking photos of the crazy ice chunks, and enjoying the view. Diamond Beach: The beach is right across Route 1 from Jokulsarlon Lagoon. It is one of the most incredible places I've ever seen. Huge ice chunks litter the beautiful black sand beach. Fortunately the sun was out when I visited and made the ice sparkle like real diamonds. Two tips: walk a few hundred feet down the beach and the tourists disappear and don't drive your car too far onto the sand, it WILL get stuck. Höfn waterfront: Höfn is a cute little town just north of the Jokulsarlon lagoon and Diamond Beach. It boasts a beautiful waterfront and great photo op. Northern Lights: We got very lucky and had the opportunity to see the Northern Lights during our time in Höfn. We stayed in this awesome Airbnb. It was the perfect place to view the Northern Lights. We were told the night we took this picture the aurora scale was around an eight. The conditions have to be just right to see the Northern Lights, but it was one of the most amazing experiences of my life! 1. Check the forecast. The scale goes from 0 to 9. The aurora has to be active in order to see them. A 5 or higher is your best bet. 2. A dark, clear sky. The further away from city lights the better. Fortunately, Iceland is remote and there are plenty of dark skies. Unfortunately, clear dark skies are harder to come by. If the forecast shows cloud cover, take a look and try to find a clear opening. 3. Wait. The aurora can show up at any time during the night. As early as 8pm or as late at 3am. This is the tough part as the cloud cover can change throughout the night. Keep an eye on the cloud cover and the aurora forecast. I got very lucky and just had to walk outside my room and see the sky full of lights. 4. Enjoy! If you are lucky enough to spot the lights, take it in! They are magical and an incredible sight to see. Pakkhus: A cozy, rustic seafood restaurant that overlooks the Höfn waterfront. This was a splurge meal for us. It was pricey ($110 for two people) but delicious! We ordered two beers, soup, fresh fish, and dessert. The portions were large so if you are going to splurge on a meal, I recommend this one! Reykjavik was the last stop on our Icelandic road trip. At this point we were pretty worn out from the driving, hiking, and exploring, but we were really excited to see all Reykjavik had to offer. I am only recommending the activities I participated in, which is why this list of things to do is so short. Hallgrímskirkja: The main church in Reykjavik. You can't miss it. It is free to walk inside and free to park around the church. Wander the streets: As mentioned in 10 Things You Need to Know Before Visiting Iceland, Reykjavik is a really safe city. I really enjoyed wandering the streets and exploring the shops and boutiques. Enjoy the nightlife: People travel from all over Europe to experience Reykjavik's nightlife. It did not disappoint. Bars stay open until 4:30am. I recommend Kaffibarinn and The English Pub (awesome live music). The Loft Hostel has an awesome, very affordable bar on the top floor! It is open to the public so consider starting your night here. The Golden Circle is a popular day trip tourists take from Reykjavik. It is a perfect one-day activity if you are in Iceland for a short time and want to see some of Iceland's natural phenomenons. The Golden Circle is made up of three main sights: Pingvellir National Park, Geysir, and Gullfoss waterfall. I went to two of the three. 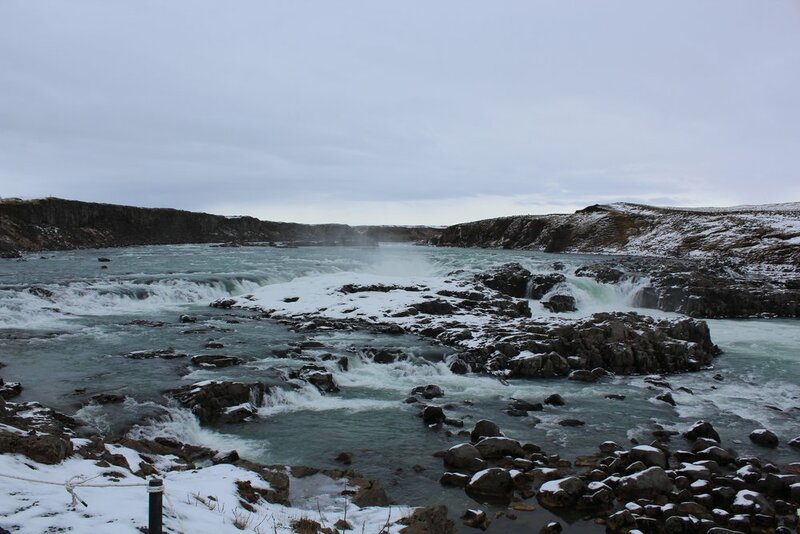 I skipped Gullfoss Waterfall due to an insane amount of tourists visiting that day. I'm sure it is amazing. Iceland is by far one of the most beautiful places I've ever seen. There is so much to explore and see, and I barely even scratched the surface. If you are interested in a free, custom Iceland itinerary, or just want to ask me some questions, email me!